Another three months between posts. It does suggest that we aren’t working, or I stopped writing, neither of which is really true. I write quite a bit, (just on other blogs) and we have been working quite a bit, just much slower these days. Will has dropped his nap, which means we have very little chunks of time to accomplish things. Back of the door, bottom half is re-oiled. 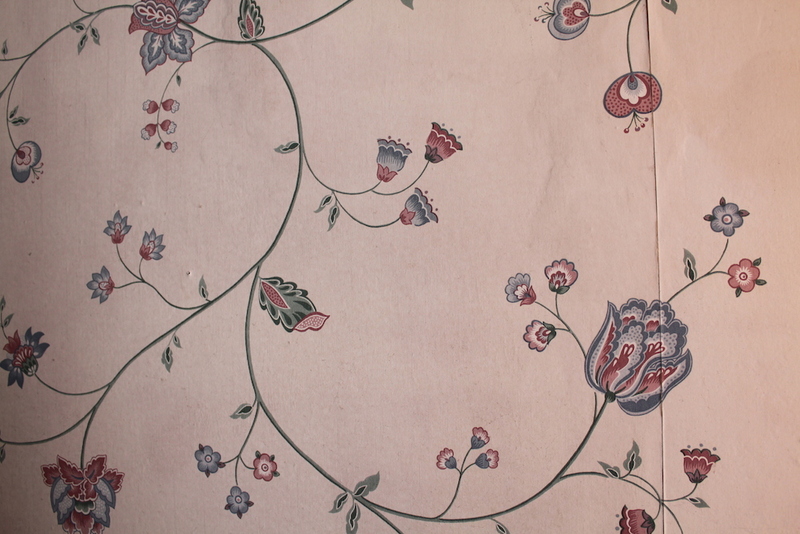 Check out this wallpaper, 80’s looking, we think. So, it took us nearly 4 months to complete our downstairs bathroom. We started in February, just taking down the wallpaper. It was both dated and dirty. And, it was stuck on with epoxy or something equally sticky. I pulled it off in micro-bits after soaking it in warm water and laundry softener. 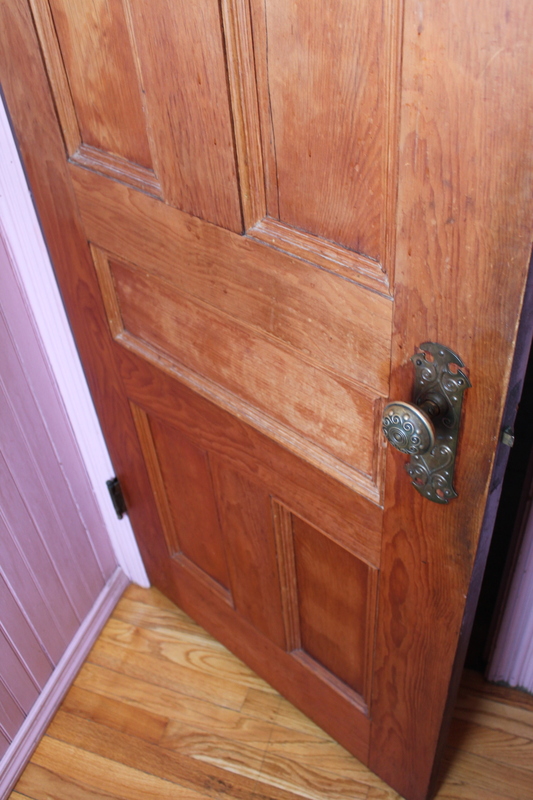 At this point, I also tested Danish oil on the door to see if it would refresh the surface. Two coats did wonders. 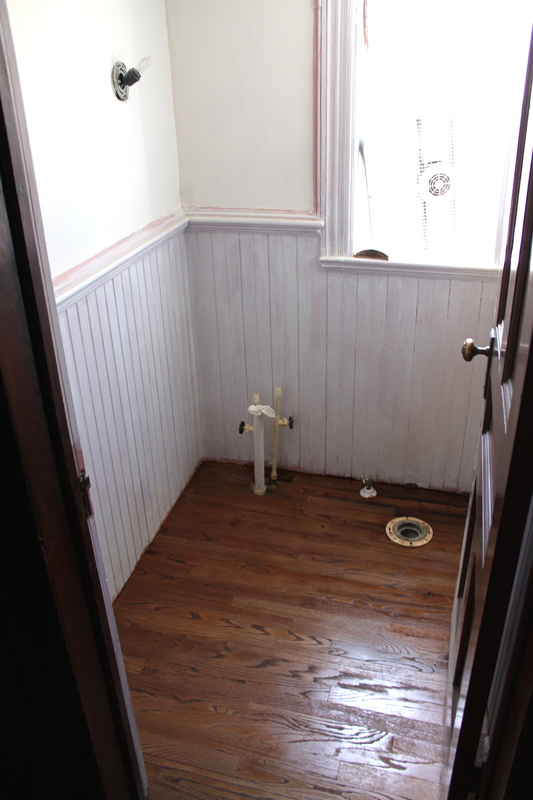 By April, we had refinished the floor and put in a new toilet. You can see the large ugly hole that we had to fill in once we took out the cabinet sink. Bill keeps a great stash of scrap wood and he had enough pieces from our hardwood floors to patch the whole. The room was small enough that Bill did the floor in a weekend, really. Sanded and stained in a day and then took two more to get coats of polyurethane on it. Toilets are heavy, but not hard to put in. We had that part complete by Easter weekend. By the end of May, the whole thing was repainted and ready for a sink. We used two different primers, one for the plastered walls and another for the wainscoting beneath. Two coats of primer on each surface and then two coats of paint on top of each of those. 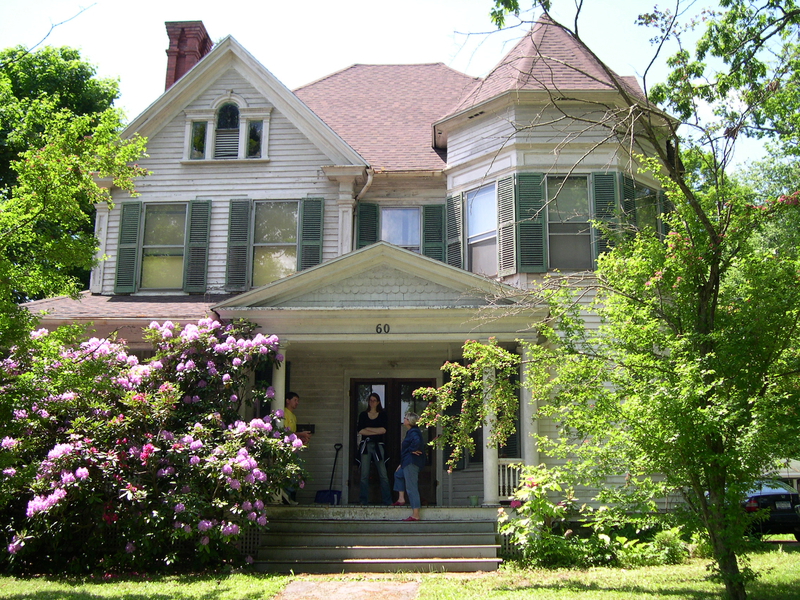 Plus, Bill caulked holes and cracks between coats. 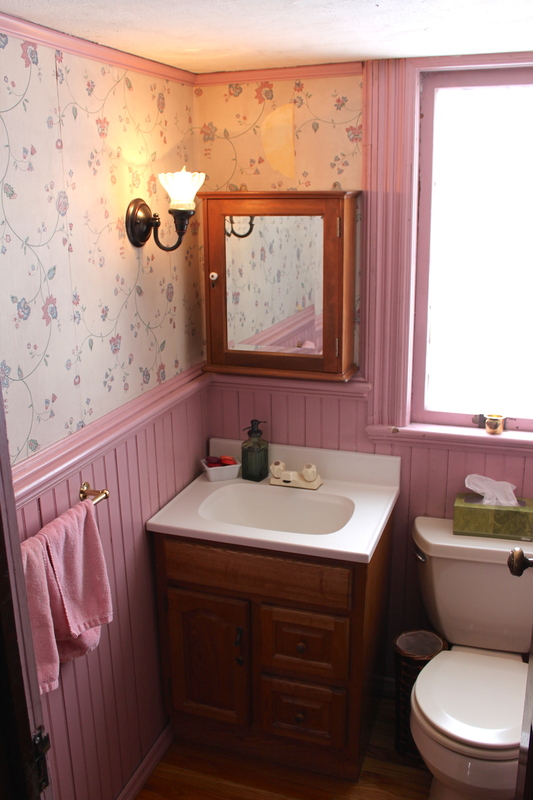 In June, we put in the sink, refinished the window and placed the fixtures. Really, Bill did all of this. He took out the window and stripped the pink paint and stained the frame, which looks sharp with the mirror and the floor. We took out the old medicine cabinet and put it upstairs where it is more useful. Moving the mirror from upstairs down works for now, too. We bought a new light fixture a few months back when the old one died and I liked the placement of it. Even though it is off center, it works for me. All of the hardware is an oil-rubbed bronze. The only thing left is to put in a new switch and find a way to put in an outlet. Like the dining room, this room has no outlets. For a powder room, it isn’t a huge deal, but it would be a nice feature to have just in case. Getting rid of more pink in this room was a big priority for me, and refinishing the floor just makes the room feel new. It is brighter and cleaner now. 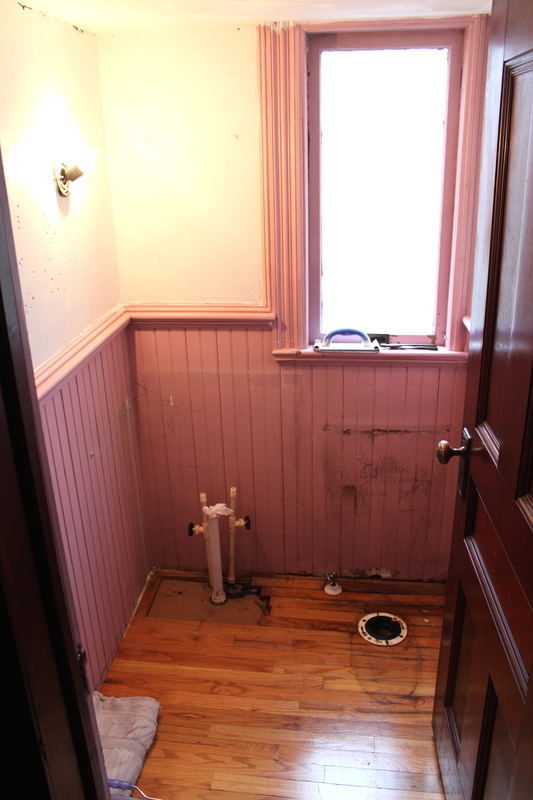 So, our half bath is overall complete. We are working on other outdoor projects right now, too, and taking time to enjoy our family and the outdoors. You both did an amazing job! 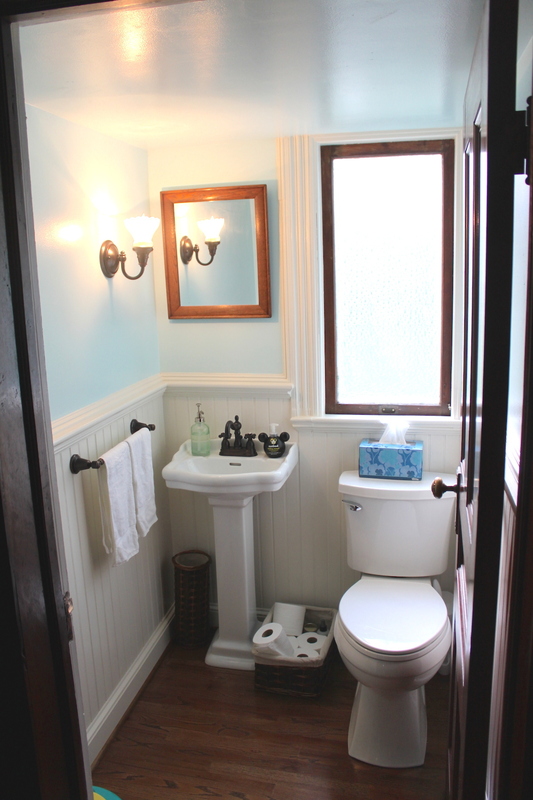 I LOVE how the powder room came out. Your hard work shows through. Beautiful! !